for increase strength and reliability. provides maximum range at the high end and true eyes-open situational awareness at low magnification. and a generous eye box throughout the magnification range. are less likely to hang up or snag during movement. with 5 day/4 low Light/2 NV levels. An “Off” position between all 11 settings completely disconnects the battery at each off position to prevent battery drain. durable construction you can trust to stand up to any cold or wet conditions. P4Xi 1-4x24 is rated 4.9 out of 5 by 32. Rated 5 out of 5 by KAC_BRAVES from Steiner P4Xi 1-4x24mm This optic has been good to me so far. I've taken it out to the range 3 times and it's held up to my usage. The glass quality is superb. It is not a true 1x scope, but it's pretty close. The illuminated red dot really sets it apart from others. A throw lever is a must-have because the dial is pretty stuff to adjust. Also, a lot of people mention that the turrets are a little bit mushy, while this is true, the scope is a set it and forget it type. Zero the optic and place the covers on the turrets, then you'll never feel the mushy turrets ever again. I would give this optic a 4/5 stars, only because i've had it for a short time. I really do enjoy this optic, and I'm glad I went with Steiner. Rated 5 out of 5 by seminoleale from Just received yesterday What a great scope. I received the scope yesterday. I have waited over a year to purchase a scope for my AR-15. A guy I follow on Instagram had just ordered this. I had never heard of it. After my research, I concluded this is the scope to have. The optic quality is above top notch. The red dot range is perfect. The included throw lever is a very nice bonus. The perfect size and optic range. Great German optics. I hope to shoot it this weekend. Keep up the great job Steiner on quality, American Made products. Rated 5 out of 5 by RupertPupkin from Excellent Glass Very impressive. Bright, clear glass. Very clean and distinct etched reticle. The red dot is vey crisp and perfectly centered. It is daylight bright on some of the lower settings even in sun. 1X seems truly 1X with no distortion or anything. Very rugged, zeroing took only a few clicks each way. Compared back to back to. trijicon TR24 the glass is equal if not better. Much prefer the red dot to the green triangle. No negatives at all. Very impressive and for the price I don't think you can get much nicer. Rated 5 out of 5 by pinback from Wow Factor! I'm very satisfied with all the features. The Steiner P4Xi is optically clean, with extremely bright and crisp resolution. The ample internal adjustment easily corrected some otherwise difficult mounting issues. The etched glass reticle is flawless and well defined. The illuminated dot is the perfect size, with eleven brightness settings allowing the perfect illumination level for any lighting condition. I like the lower settings in daylight, giving just enough illumination without aberration. The low profile capped turrets are nice, the scope adjustments stay put. The compact overall size is a plus as is the lifetime warranty. This scope is made in the USA and item #5202 comes with a free "throw lever", a very useful upgrade. Factoring in the modest price tag this scope is simply amazing. 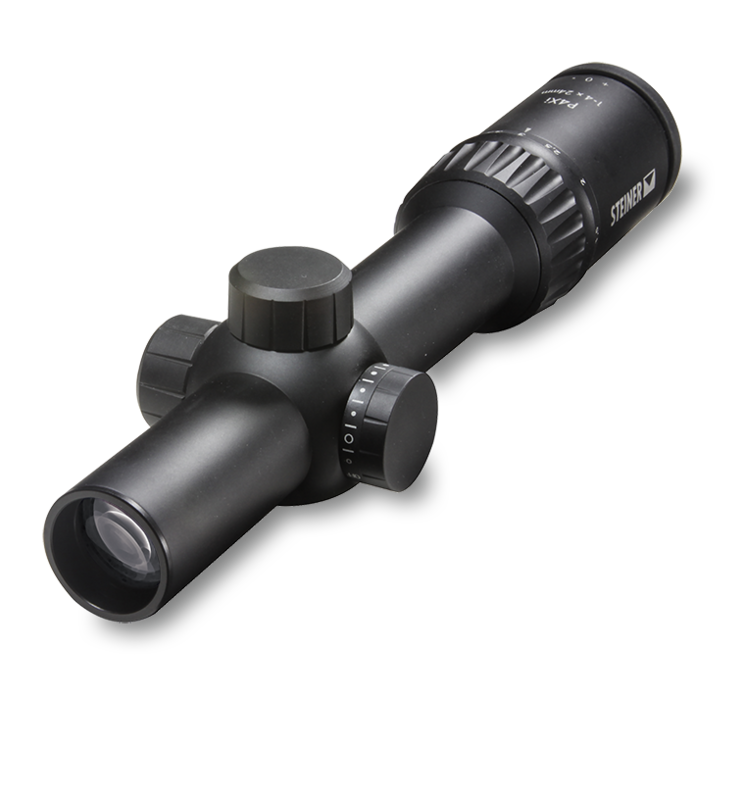 Rated 5 out of 5 by Rhod from 4.5/5 stars Great Value optic Great optic. Can only compare to Vortex Strike Eagle, and Trijicon ACOG..With that being said. PRO: The glass is clear. the red dot is daylight bright even in the Arizona sun. The reticle itself is simple, clean and easy to use. The build quality of the scope is amazing, especially considered its price. CON: Newish scope that lacks detailed documentation ( What size power ring is the optic, so you can purchase a throw lever?) The 1x isnt a true 1x, its slightly larger. Still very workable and quick, better than other 1-x scopes I have used in the past. Rated 5 out of 5 by TannerG from An incredible deal This optic is superb. It is amazing that they are selling this scope for the price that they are. The glass for this optic was confirmed to be of the same quality as their 1-5 which is far more than double the price!! Im almost afraid to put that in the review with the thought that they will realize that and double the price. The clarity of the glass is unrivaled by any glass I've looked through and keeps that clarity all the way out to 4 magnification. The dot is crisp and draws the eye and does not have any ghosting. The crosshair is simple yet extremely useful although I do wish it had windage marks. The included throw lever also seems to be of very high quality and is easy to install. As others have said the only real cons are the "mushiness" of the dials. Its not a big enough deal for me to think about it but I do wish they had made them a little more positive. Overall an amazing deal and I will be buying at least one more while these scopes stay at this price and are readily available. You WONT be disappointed with your purchase. Rated 5 out of 5 by Fishpg from Steiner P4Xi I recently purchased this to mount on a BCM rifle. It has been through a Frank Proctor class and has several thousand rounds through it. The scope has been banged around and has not been "babied." I have shot it from 1 to 460 yards. The dot is perfect for both CQB and long-distance shooting. My only complaint is the "mushey" feel between intensity level settings. I would definitely buy this scope again. It is much better than my department-issued Leupold VXR-Patrol. What are the diameters of the ocular and objective (for the purposes of lens covers)? Are the turrets Zero Stop adjustable? The P4Xi scopes do not come with Zero Stop Turrets. Does Steiner offer a military discount for Active duty? Will the illuminated dot be blurred by astigmatism? I've noticed in some etched glass it doesn't (prism scopes), but I looked at another scope where just a dot was illuminated and it was distorted. Typically, astigmatism will distort projected aiming point, but with the P4Xi having an etched reticle, it should have no more distortion than the reticle of any other riflescope. Yes, it uses a fiber optic illumination system. is this scope capable at night?? if not, what night optics do you have? Yes it is! It has 5 day settings, 4 low light settings, and 2 night vision compatible illumination settings.